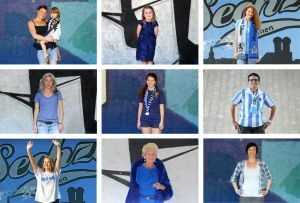 Sixty women and girls – sixty portrays – sixty „Female Lions“ – sixty fans of the club TSV 1860 Munich (also called “The Lions” or “Sixty” – “Sechzig” in German). With the photo exhibition “Sechzge, Oide! Female Lions with Heart and Soul”, organised by the local fan initiative “Löwenfans gegen Rechts” (“Lion Fans Against the Far Right”), showed that women and girls are on firm ground at the stadium of “The Lions”. Our Fan.Tastic Female Stephanie Dilba was co-responsible for organizing this beautiful project as part of the “Löwenfans gegen Rechts” in 2017. The female supporters were portrayed by photographer Anne Wild who has been a supporter herself for many years. Apart from that, the girls and women also told snippets of their fan story – how they got involved in the fanbase, what they like about 1860 (and what they don’t like) and which game they’ll never forget…. At the end, there were 60 portraits showing the women and girls as a community, as colourful and diverse as it could possibly be whilst united by the conviction that „Sechzig” is the greatest club in the world. The exhibition was shown in Munich several times, each time with a big programme around it. Here you can find a small video about the „Sechzge Oide!“ exhibition.